Take a look at our range of Rainwater Controllers. 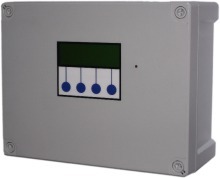 The Rainwater Controllers below are reliable, long lasting and they can be customised if needed. The 3P RainForce commercial rainwater controllers performs all the functions you would expect of a commercial system such as adjustable pressure, duty standby/assist and BMS output, whilst remaining extremely compact. They can be supplied white label to be customised to your needs or branding. Applications include: Header tank control, tank top up control and pressure control. If you are looking for a complete rainwater harvesting system contact us and we will find the perfect solution for your needs.